If the return of The X Factor on Saturday 2nd September wasn’t exciting enough, it also saw the launch of our brand new TV ad, the culmination of months of hard work behind the scenes. We’re immensely proud of our new TV ad, which focuses on family life around the home, and the important role our bathrooms play within that drama. We hope you like it too. So, without further ado, let’s meet the family. Our family consists of Mum, Dad, 3 children and Wilma the Dog. If this faithful Basset Hound looks familiar, that’s because she has already featured in one of our previous TV ads, and you’ll no doubt be seeing much more of her in the coming months. You may have also noticed some other familiar faces, including actress Susan Cookson, who recently portrayed Marion Logan in Coronation Street, and Paul Warriner, who also made an appearance on The Street back in 2011, playing D.S. Redfern. As our advertising campaign continues, you’ll find out more about each individual family member, and how the bathroom features prominently in those dramatic moments in their lives. Head to our Facebook page, and let us know your favourite #familymoments from the ad for your chance to win one of 100 Wilma the Dog soft toys! One of the first things you may have noticed about our TV ad is that our beautiful bathrooms don’t actually get a lot of screen time! However, there is a very special reason for this. As part of the story we are trying to tell, we wanted to demonstrate the breadth of everyday family life, in which our bathrooms play a major role. "A home can be an unpredictable space. A cacophonous, colourful, passionate place. Where housework and homework and emotions collide. As everyone does what they need to survive." As we all know, a family home can often feel more like Piccadilly Circus, especially when we’re all rushing around, trying to get ready for work or school, and inevitably someone else is using the bathroom, just when you need it the most! It can, however, in rare moments, be a place of peace and tranquillity, perfect for recharging batteries (both literally and metaphorically), catching up on the latest news or enjoying some well-earned shut eye. "We come together, we play our part. Sometimes with tears, but always with heart. So, don’t worry, it’s never that long before we’re back to our best." Our homes also perform another vital function, and that is to bring us together and help us bond. From watching The X Factor in the living room, to playing board games in the kitchen, it’s important to have a comfortable space in which we can do all those fun things that unite us. "There will be thick, and there will be thin. Days of absolute contentment, and those others, not feeling quite right in our skin. But the difference it makes, now and then, to gather our thoughts, wash away the day, or say the things we didn’t know we needed to say." Of course, family life doesn't always run smoothly. There are days when everything seems to go wrong, dramas blow up out of nowhere and plenty of tears are shed. Amongst all this, your bathroom provides an unassuming, yet equally important function: As a place to retreat from the hubbub, watch the football on your mobile (so you can discreetly check whether that cheeky bet has come in or not), and generally spend time looking after yourself. However, it’s not all about personal reflection. It can also be a place where you get to spend valued time with the kids, chatting with them and finding out what’s on their mind, at bath time or even when they’re attempting to give the dog a wash! "It’s true. Lounges are lovely. Bedrooms can be bliss and kitchens tempt us back time and again, but it’s our bathroom that keeps us sane." At the end of the day (and not forgetting the start! ), out of all the rooms in your home, it’s the bathroom that truly keeps us all on an even keel. Allowing us to pause, think and relax. Filmed on location in Didsbury, Greater Manchester, and Hessle, East Yorkshire, the original concept was conceived by the VictoriaPlum.com marketing team, spearheaded by Marketing & Customer Director Nigel Hunter. Nigel said:“This TV ad marks the beginning of a new and exciting direction for VictoriaPlum.com. After extensive customer research, we looked at the different roles our bathrooms perform as part of everyday family life. From the functional, such as washing the dog or getting ready to go out, to the more emotional, like finding somewhere private to retreat to when upset or nervous, bathrooms provide just one of many backdrops to the drama, tears and laughter we all experience throughout our lives. As such, we believe everyone should be able to afford an inspirational bathroom for just these family moments. In the first of a number of different creative treatments, we decided to focus purely on the family, introducing Mum, Dad, children and even Wilma the Dog. It may seem unorthodox that the bathroom barely gets a mention at this stage, but we felt it was important to portray the bathroom as just one of many places where family life unfolds. 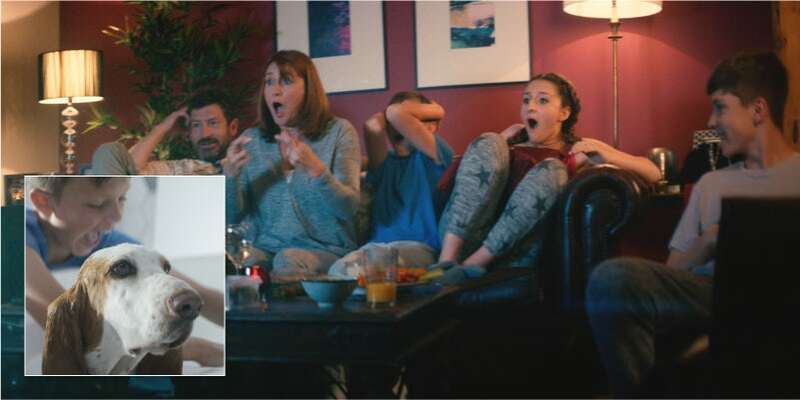 Don't forget to let us know what you thought about our TV ad on Facebook, plus, share your favourite #familymoments from the ad for your chance to win a Wilma the Dog soft toy! Keep an eye out for more new VictoriaPlum.com TV ads and #familymoments in the coming months. If you're looking for a darker look and feel for your bathroom, we'll help you create your very own refined retreat with this handy style guide.